The first step in the whole process is to download the program known as 'Boot Camp Assistant' from Apple. 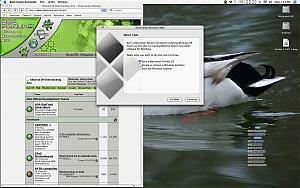 Currently, the program is still in the beta stage; it won't be finalized until the next version of MacOS is released. When you open the program, you're presented with several different options including: burn a drivers CD, create a Windows partition, start the Windows installer. Burning a driver CD is as simple as inserting a CD and pressing 'Burn.' 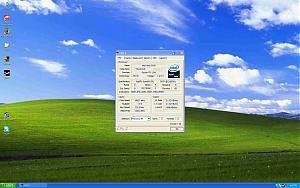 It seems to include most, if not all, of the drivers you need to get your computer fully functioning in Windows. After burning your driver CD, you need to create your Windows partition. I understand that you can partition off your existing drive without losing any data, though I purchased a second hard drive for the sole purpose of installing Windows so I cannot confirm nor deny this. The whole partition menu is very straightforward; there are several suggested sizes or you can customize the size of your partition. Formatting takes a very short period of time. After the initial installation process, you set a default drive to boot to. When you start the computer, a grey screen appears during the startup chime. While this screen is displayed, you can press the option (alt) button to choose which partition or drive to boot to. 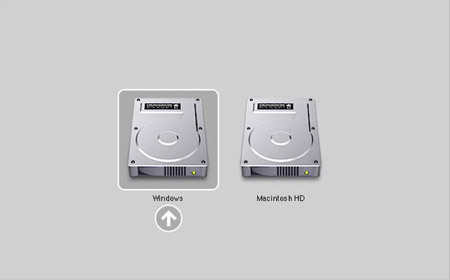 The menu is extremely simple and clean-looking; it simply displays two drives with names underneath of them. Windows runs great as it should. I haven't had any problems so far, save for the fact that the eject button on the keyboard will open the optical drive but not close it. Oh well, I suppose that may get fixed with a later driver update. Windows correctly picks up on all of the CPUs and cores and seems to utilize them. I've included a CPU-Z screen below for your viewing pleasure. Half-Life 2 runs at a great framerate with all of the settings cranked to max and I scored 6044 on 3DMark06 without any tweaks, which I understand is an acceptable score. I should note that this system has the x1900xt option and the default 1 GB of 667 Mhz FB-DIMM memory. This switch to Intel processors and the release of Boot Camp marks a very exciting time for both existing Apple fans and people who have thought about using an Apple computer in the past. 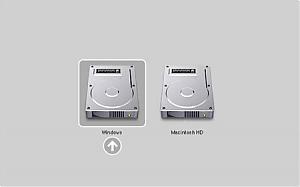 Those who already have Apple computers can run Windows and thus play any games they might otherwise miss (as well as run other Windows-only programs.) Those who have thought about trying MacOS but have been reluctant to do so are quickly running out of reasons not to just give it a try.